As the story goes, the last congregant at Boston’s Vilna Shul was mugged on his way out the door one day in 1985. He never returned to the deteriorating old synagogue. For the next decade, no one spent time in the temple except birds, because a skylight broke and let in the weather. Vilna Shul is a historic landmark and Jewish cultural center in Beacon Hill. Though the neighborhood’s reputation is as a home for the rich, Vilna Shul served the poor immigrants who lived in tenements on the north side of the slope. The Lithuanian Jews who founded the congregation, many of them from a city called “Vilna” in their home country, worshipped in an apartment building at first. They were granted a state charter in 1903, and later bought Twelfth Baptist Church – an African American church. Vilna congregants refashioned the Church’s furniture, by removing the horizontal lines forming the cross symbols marking each pew. When the city took this building by eminent domain to build a school, the Jewish congregation used its payout to buy a tenement building a few blocks away, at 14-18 Philips Street. They knocked down the tenement, known to have been a brothel before a slum, and built Vilna Shul. It was completed in 1919, replete with circular stained glass windows. But their neighborhood was in turmoil. Congregants moved out when they could afford to. Most significantly, the entire West End neighborhood was demolished under a controversial urban renewal project in the 1960s. Vilna Shul held its last Rosh Hashanah in 1979. 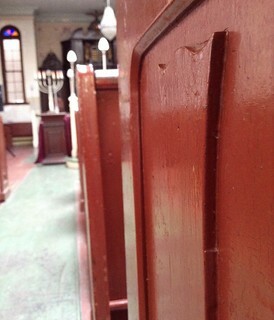 The Vilna Shul merits preservation as the last intact example of an early 20th century house of worship in Boston. 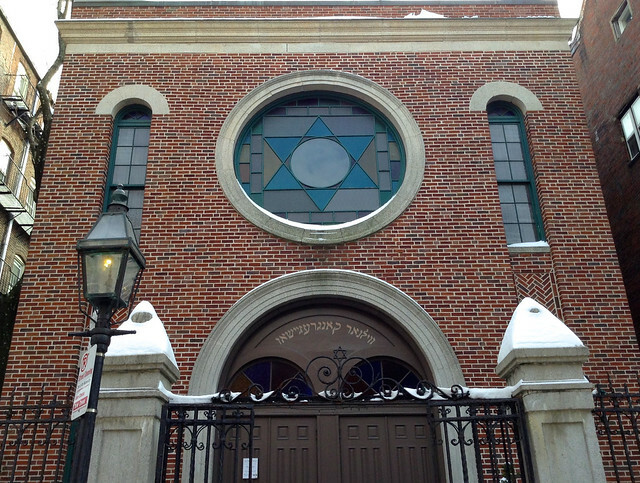 It is the only synagogue in Boston listed in the National Register of Historic Places. By then, nearly 40 other synagogues had already been demolished or transformed. 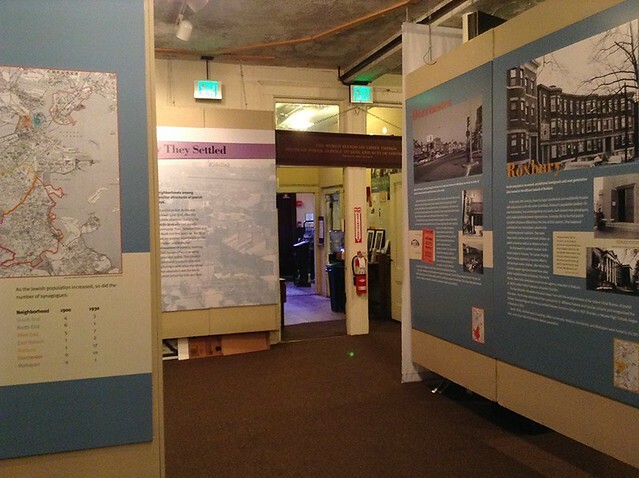 The Vilna Center for Jewish Heritage, Inc. bought the building back with a grant from the Boston Foundation in 1995. Even after much work, Vilna Shul is in visible disrepair. A baited mousetrap waits in one corner. Walls are cracked. Plain paint covers beautiful old murals. Progress towards restoration has been slow. But they still have the old Baptist pews, now about 150 years old, and they’re proud of them. Today the synagogue is a living museum. Staff and volunteers host inter-faith events, Jewish holiday services, and daily tours of the interior. Anyone can walk in and see. Post and photos by Alexa Mills. This is one of many posts responding to the question, “What’s Happening at the Oldest Buildings in Your Town?” If you’d like to submit an example from your own city, see the easy steps here. Check out yesterday’s post on The McMillan Memorial Library, in Nairobi, Kenya.